A rather interesting title now from an obscure company called Gamesware. 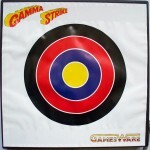 Gamma Strike is a kind of a light phaser/target pack, with the target board plugged into the computer. “Another creative use for home computers has been found by a Liverpool based company called Gamesware. 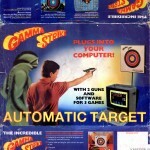 They are currently marketing a game called Gamma Strike which retails at about the “23 mark for C64, Spectrum and Amstrad and comes in a large box complete with two air-powered plastic pistols , some small soft plastic lellets and a target mounted on a touch sensitive board that plugs directly into your compluter – plus, of course the necessary software. Hmmm, sounds like a potentially dangerous pack, with maybe the ability to fire pellets at others in the room. To be honest, the game probably never got past the standards phase, and was ruled to be too dangerous. And it seems that it didn’t… well, at least in a mainstream way! 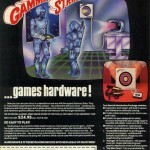 Gamesware struggled to get the product onto mainstream shelves due to the health and safety hazards of the package. They resorted to shifting just a few copies over mail order and through petrol stations in the Manchester and Liverpool area! Recently the game’s lead programmer Simon Phillips got in touch with GTW whom shared the above information. Simon was only 15/16 at the time and assembled a team of himself, another programmer, a graphic artist and a musician to construct 3 games to go with the gun technology. They only had a month, but they produced 3 reasonable games to go with the gun..
1. 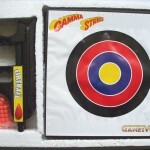 Competition Shoot-out – A simple game where two players compete against each other shooting the target and getting scores. Written in BASIC. 2. Voyager 19 – A better title with two space rockets where each player takes turns to fire and score depending on where the target was hit. 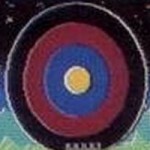 Each shot would send that player’s space rocket up towards the top of the screen. First one into space would be the winner. 3. The Alien Team – Probably the most intruiging title of the pack, where the game hardly uses the target until the very end boss. The game is predominantly a side scrolling SEU. The package had its limited release, and the developers got a small bit of money without royalties (Which may not have been a bad thing in the end!). However, it is only now that the games have finally been preserved. Simon kindly posted one of the last packages of Gamma Strike known (Possibly the only one left in existance), where GTW has taken high quality photos of the packaging, internals and also fully preserved the 3 games which came with it! The only problem is that at present the games are completely unplayable without the target, and Alien Team needs someone to shoot the target to start the game! Well, shortly after release on GTW, Triad sorted Alien Team and Voyager 19 out (The two key games) and released versions which allow you to use keys to replace the target, as well as the original hardware if you ever discover it! 🙂 . A great discovery for GTW, and finally preserved after all these years! I think I may have the complete boxed version (including target, guns and software cassette) sitting up in my sisters attic. I will try and dig it out sometime this week and you are more than welcome to borrow it. Not entirely sure if you will be able to get the tape working but it will be an unused tape and has been stored in a dry environment. The game was released in a limited form. 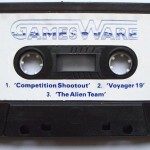 Gamesware struggled to get it onto the shelves of the major retailers so they resorted to selling it mail order and giving copies of it on sale or return to petrol stations around the Manchester & Liverpool areas!!! If I remember correctly, there weren’t many made and the one I have is probably the only surviving copy. Way back in 1985 I was in my last year of high school and an avid C64 coder, along with my school friend Stephen Kay – we tinkered with the usual stuff, demo’s, modplayers, parallax scrollers etc… One day I saw a tiny advertisement in the Manchester Evening News asking for Commodore 64 programmers. I answered it and, alone initially, went along to a meeting in Reddish (near Stockport) with a company called CPF Technology (later Gamesware). They produced some kind of scientific instruments for Manchester university. The company consisted of an academic called, I think, Andrew and a “happy go lucky” Iranian entrepreneur called Satar Avil (or something similar). 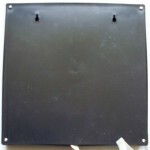 The company had developed a target that consisted of concentric metal rings connected to some kind of transducer and logic board that interfaced with the C64’s user port. Whenever an impact was made on one of the rings a logic 1 or 0 was presented at the user port. 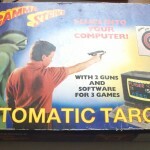 They wanted to market the product as a shooting game and needed the software to go with it! They had a prototype of the target for me to take home with me and, as I had travelled by bus, Satar agreed to give me a lift home. That was a mistake. Satar was a happy, jolly chap who had absolutely no concept of safe driving! After cutting up every motorist on the road and charging at insane speeds through oncoming traffic in his Volvo 240 we finally reached a section of road where you could stay left in the left lane to use the A roads or the right lane for the motorway. As we approached the fork at about 50 miles an hour Satar asked me which lane he should be in. The central reservation that divided the fork was approaching so fast that all I could do was scream. At the very last second he flicked the car to the left, gave me an insane grin and happily carried on as though nothing had happened. I did everything I could to avoid going near a motor vehicle with Satar after that! Anyway, the prototype target consisted of a poorly made contraption and a couple of metal “spud” guns. That evening I knocked up some code to display values read from the user port, liberated a few of my mum’s potatoes and confirmed that the “target” did, in fact, work. The company wanted a series of mini-games produced quite quickly so I assembled a team of friends who had all worked on demo’s together. My second in command and coder was Stephen Kay. Another friend called Adam Leonard was roped in as Graphic Artist. I was also friendly with a twenty something lorry driver called Dale Edgar. Despite the age difference, I had become friendly with him via our local computer club. He fancied himself as an amateur musician and used to love creating music on the C64 (Much to his wife’s annoyance). He was roped in to produce the music. All of the team worked from their respective bedrooms (well, actually, Dale’s wife made him work from a cupboard under his stairs). The brief was simple: Stephen and I would code. Adam would draw and Dale would create original music. Stephen and I had no problems with the code. Adam was a talented “paper” artist but his C64 graphics skills were somewhat inferior. When we asked him to produce some scary looking aliens they all came out… well… rather fluffy and a touch tubby to be honest! Dale, however, produced some superb original music (at least we thought so when we first heard it)! 1. 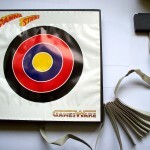 Competition Shoot-out – The only game that wasn’t featured on the box shots! 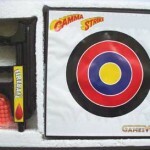 No surprise really as it simply consisted of two large digital font style “scores” for two players that increased by a preset value depending on which part of the target was hit. The gameplay swapped between the two players until one had reached a preset number of points! Enthralling! 2. Voyager 19 – The pack shot with the target in the middle and the two space-rockets (that look like tall jelly moulds) at either side of it. Similar to “Competition Shoot-out” in that players took turns to fire and were scored according to the part of the target they hit. Each shot would send that players space-rocket up towards to the top of the screen – the first one into space was the winner! 3. 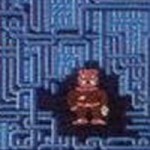 The Alien Team – The pack shot with the strange brown furred alien standing inside the maze of pipes. Firstly, the pipes had absolutely no meaning to the game whatsover – they were just the best that Adam could come up with when asked for “futuristic”! By this stage of coding we had got bored of just reading the target and applying a score to a counter! We cheated! The first part of the game had nothing to do with the target at all – It was a left to right scroller with waves of aliens attacking a player ship in a sine-wave pattern against a parallax starfield (i think). The player moved the ship with a joystick and tried to shoot the aliens. If they survived long enough then they entered the “pipe-room” and had to battle the boss (the cuddly brown furred thing) – This was simply a matter of shooting the target before the “boss” could draw his gun! 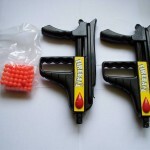 The production version of the product replaced the spud-guns with plastic ones that fired small plastic balls. Useless really as they tended to get lost. 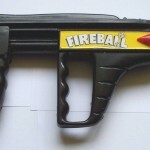 The guns had a hopper that you could load with balls and they constantly jammed. Stephen and I were at Gamesware’s offices when the pack shots were being taken. They needed a pair of hands to hold the target up. Mine were too big (I was 6’3″ with hands like shovels even at 15) – so they tried Stephen’s! His are the hands that can be seen in the pack shot. Needless to say, we never worked on any other projects as a team. I went on to be the secret mastermind behind F29-Retaliator (originally called Ironfly and set on Mars) and Lost Patrol on the Amiga but, as they say, that’s another story (especially the bit where we made the great Gary Bracey of Ocean Software go white when asking for our royalty advance)……. It should be a really simple job of replacing all the LDA $D018’s to a JSR that returns the correct bit code in the accumulator corresponding to keypresses (say, the 1-4 number keys or maybe the F keys). Basically the target is just a series of switches that toggle a line on or off in the user port. The user port lines are swtichable bi-directional and will all be switched to be input only. Whenever the target is hit it just pulls the corresponding line high. This can be read in the CIA register at $D018.